Cloud technology is already becoming ubiquitous with more and more businesses leveraging the cloud in some way or other. According to Gartner, a technology research company, by the end of 2017, nearly half of large businesses will be using the hybrid cloud which combines private and public cloud services. So, what are the reasons that are driving businesses to adopt cloud computing? As per the study, the most popular reason for businesses to move to the cloud is its ability to help them enhance process functionality with cloud-based applications. Think of the cloud as an entity that makes advanced technology more accessible to businesses in a more affordable manner. Consider for instance a scenario wherein a business finds itself in need of extra IT resources like more server space, advanced hardware etc. Traditionally, the process of adding extra IT resources on-premise is long and arduous. The deployment of these extra resources may take anything from a few weeks to months depending on the need. What if you cannot afford to wait for these extra resources? By leveraging the cloud, businesses can access all the software, platform and infrastructure they need, quickly and affordably. With cloud-based infrastructure, new computing resources are only a click away, which means you can reduce the time it takes to make those resources available to your developers; your projects don’t get held up and your business can use the best of technology to get an edge over your competitors. One of the primary financial reasons for businesses to adopt cloud-based solutions is that it lowers the cost of ownership of IT infrastructure. On-premise business application deployment has a much higher total cost of ownership (TCO) as compared to a cloud-based model. In a traditional IT ecosystem, TCO of on-premise IT infrastructure includes factors like server hardware storage and maintenance, security system maintenance costs, administrative IT costs for systems and database and more. But with the pay-as-you-go subscription based structure model of the cloud, you don’t incur the administrative and maintenance costs associated with on-premise IT infrastructure. The cloud service provider is in charge of maintaining cloud based solutions and also updating them if and when needed. You don’t have to worry about spending money on software license, maintenance of hardware resources and upgrade etc. The great thing about cloud services is that you can scale up your subscription plans (add hardware resources or use more storage space) to meet the growing needs of your business, or scale-down the use or services if you think that’s needed (in a slowing economy). This is another huge reason driving businesses towards cloud migration. Irrespective of their size, companies typically have to make a huge investment in technology throughout their lifecycle. Technology is needed to get their business up and running, functioning and delivering on their objectives. More often than not, companies get locked into using an old outdated platform/software system because their workforce is comfortable with its use and it is expensive to replace such systems. This old outdated technology is called legacy technology and replacing any legacy system is an extensive and expensive process; many prefer to keep using established legacy systems and don’t move onto using advanced systems. But this endangers business as it prevents growth and expansion. The cloud provides an answer to this problem. It permits seamless integration of modern and legacy systems, solving the problem of old set-up while preparing businesses for future requirements. Over time businesses can rid themselves of their legacy systems and replace them with new and better systems available through the cloud. This will do wonders for their business efficiency, productivity and ability to meet the needs and demands of their target customers. Businesses know the ‘customer is king’. However, there are many businesses who cannot afford to deliver the kind of service and support that comes good on customer expectations. For many companies, the inability to offer great customer support stems from a paucity of resources. They cannot afford to spend time, effort and money on customer support and this is where they lose the battle with their competitors. Astute companies have found a friend in the cloud. They are signing up for cloud based CRMs that are helping them improve customer relationships. They are able to control and manage their customer facing operations in a manner that delivers the best results. With a cloud support system, a company can provide support globally for 24 hours a day, 7 days a week and streamline all its operations and support systems to provide excellent customer service. This is another good reason for businesses to adopt cloud computing. Today businessesmust respond quickly to the push and pull of the market. If your business cannot react to changing marketing equations quickly, you might have down your shutters. One of the ways you can quickly adapt to the changing needs and demands of the market is by using technology. You need to keep adopting the latest technology to stay competitive and survive the vagaries of the market. But as can be imagined, this is not easy. There are many factors like cost, time, effort, your business will need to consider before using any new technology. On the other hand, cloud computing provides an unmatched degree of flexibility to react to volatile market conditions without putting the business at risk or incurring unbearable costs. Cloud service providers keep refining their offerings, releasing new services, products and features to keep pace with the changing demands of the market. Business operations are thus more flexible with changing business needs with the adoption of cloud computing. If you are not adopting cloud today, then you will tomorrow! Cloud is the new age technology destination for all businesses. Early cloud adopters will have competitive advantage as they will be able to make better business decisions, have deeper collaboration, strengthen innovation, improve performance, add advanced security and strategically reinvent their business. Businesses that have moved to the cloud are growing revenue and gross profit faster than companies who have not moved to cloud. There is absolutely no doubt that moving forward, all businesses will need to leverage the power and flexibility of the cloud if they want to succeed. It is clear that analysis of real-time data is essential for today’s businesses. But it is nearly impossible for on-premise solutions to scale the massive amount of data generated today in real-time. 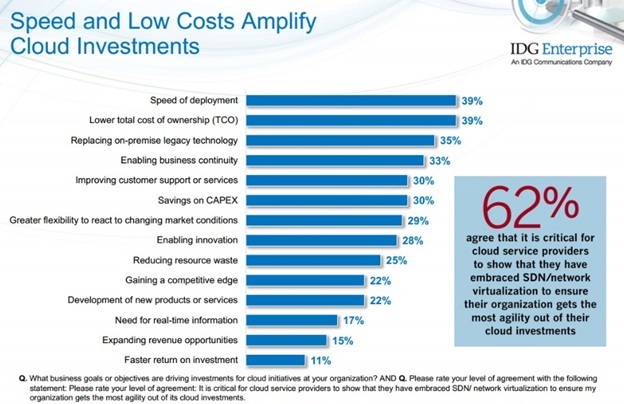 This is the reason businesses are moving to cloud. Apart from analysis of real-time data, cloud even allows real-time collaboration on documents allowing all employees, irrespective of their location to sync up and work on shared documents or projects simultaneously. A survey by Frost & Sullivan found that companies which invested in collaboration technology had a 400% return on investment – a good reason for companies to use cloud enabled collaboration technology. These are just some of the many reasons why using cloud technology makes tremendous business sense. So, are you using it for your business? If you are, what made you move to the cloud? We would like to hear your reasons. Do share in the comments section.